Really beautiful, love all the attention to detail, colours everything!… also like the photo showing the laundry so often this is missed out and its a really curious thing for me how this is incorporated. I have been mostly good, could I please have a Tiny House? I will put your milk in cookies in the same place as last year. Luke, I’m not sure who’s tiny house you are commenting on, but it can’t be a Tiny Heirloom house unless you are blind! 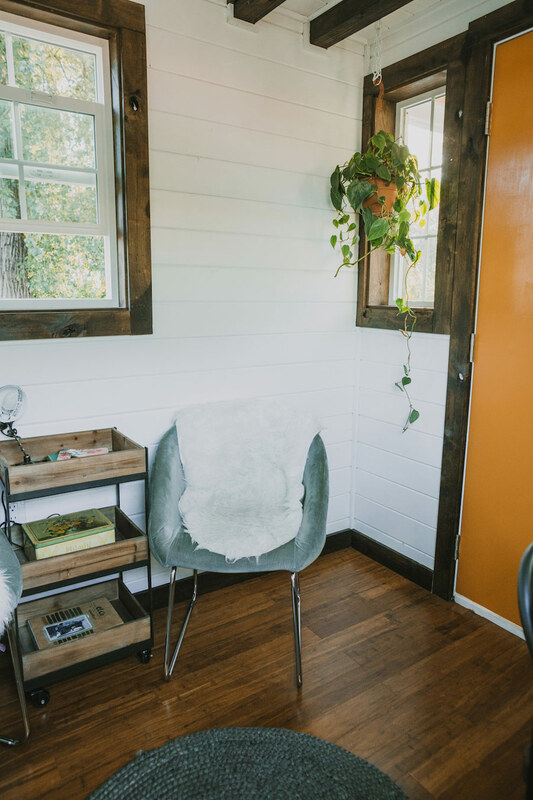 What a lovely, homey and tastefully styled tiny home. Absolutely beautiful. Well done. I love it. I am looking for ideas on my future Tiny Home. This wood, chrome and white is perfect. I want the rustic antique look for my home using small pieces of furniture. Your home design and decor is beautiful. One of the ideas I will put away for when I build mine. Nicely done! I enjoy getting ideas for my home to be, and appreciate pictures with people in them as it helps in thinking of scale. I love seeing the owners in the pictures. The contrast between white and dark wood color is gorgeous and it looks like a piece of ART! Hope the house fills you with love and happiness for a long time to come! Stunning! Awesome job and thanks for sharing your beautiful home with us! I love it! And where did they hide their clothes? Other than that I has a very nice visual appeal. 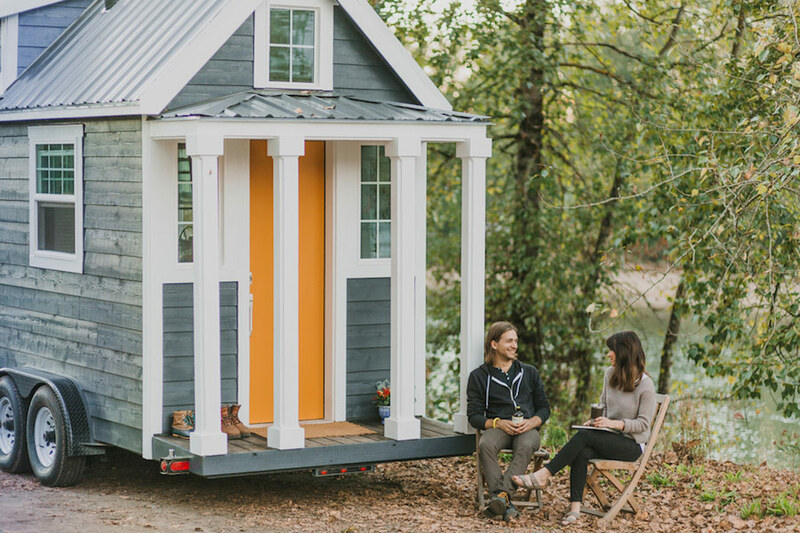 One of the BEST tiny houses I’ve ever seen! 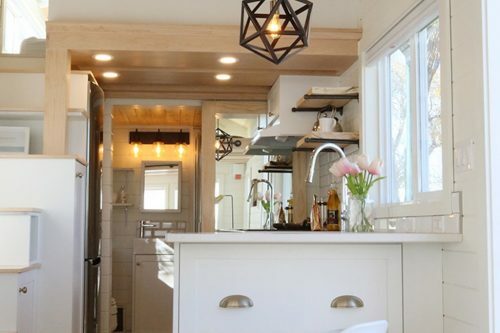 Love the little stove, lighting fixtures, mix of old and new. Well done! Bravo! STUNNING! 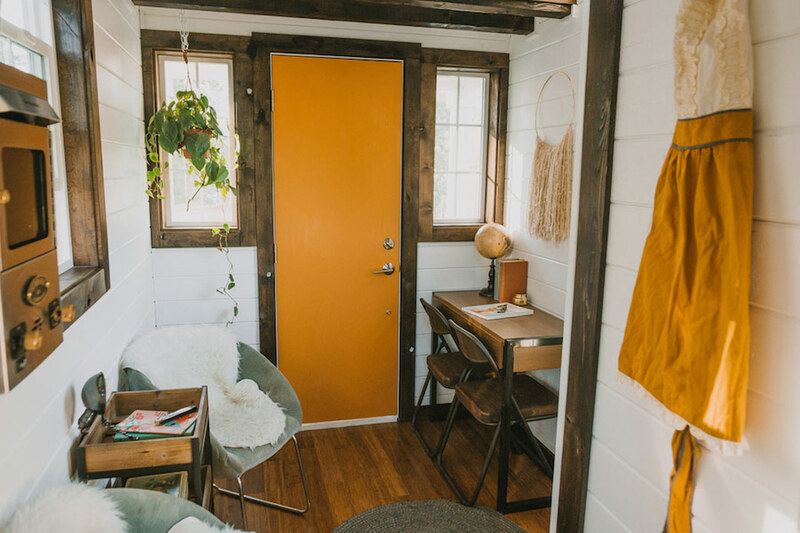 So very tastefully done, this is a very classy and truly lovely tiny home. The contrast of dark wood beams against white, the marble benchtop, proper stove, realistic size clothes hanging space above washing machine, skylight above bed….. I could go on and on! This is definitely one of the nicest Tumbleweed homes I’ve seen. I could never live in something quite that small, but I applaud those who can. A beautiful home. I would love to know the model of the stove and the bathroom sink. They are just perfect! Stunning home. 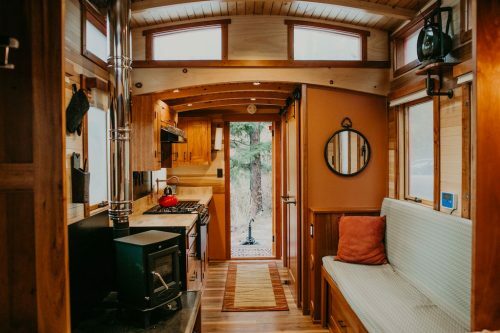 One of the most beautiful tiny homes I’ve seen. It is easy to see that there was much intention in it’s design and decor. I didn’t see a coffee maker or pots/pans in the kitchen. Is it assumed they are in the cupboard? Also didn’t see where clothes were stored (besides 4 sweaters) and wondering where they are stored. Are toiletries and bathroom products kept under the sink? Do you have a broom closet we didn’t see? Just asking all of these questions as I’d love to have one myself and want to think such items through in advance. Thank you for sharing. So much more personality that a lot of the Tumbleweed-style homes we see here! I just love it. Like the inside and all so it can be move to a new place. Absolutely stunning! And the beautiful couple just adds to the perfectness! I love how it feels so warm and inviting. The whole house is beautifully done. I particularly love the kitchen but I also love the outside looks of the overall house, too. This is so well done! Congratulations on your exquisite home! would really be interested in seeing the floor plan. photos inside have nice perspective. what sort of lense setting were used to take those pictures? for a transportable home timber doesn’t seem to practical, obviously good engineering would have gone into this..hopefully. while it does look pretty. 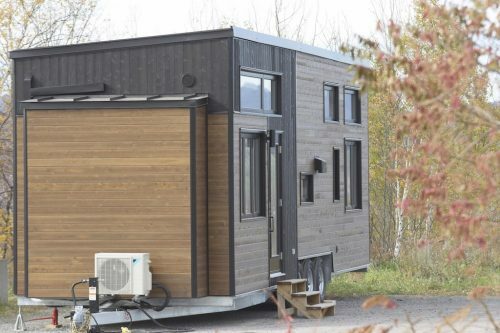 would love to know more about fixing details and material life cycle, also structure to know if this will actually be a mobile home. While it is very homey & inviting, it really is a place for young couples or still-active empty nesters. I can’t envision children living in such a tiny space. Also would never be practical for older people needing handicap accessible spaces. But still adorable for the right homeowners. Your home is absolutely perfect! I love everything about it–awesome eye for style and design! Oh, This is so beautiful! I love the whole house inside and out! I’m getting older and I know my bed would have to be on the main floor. I would have something that I could easily pull down off the wall if that’s possible but still keep the loft bedroom also. It’s a dream house for me right now! My style of house! 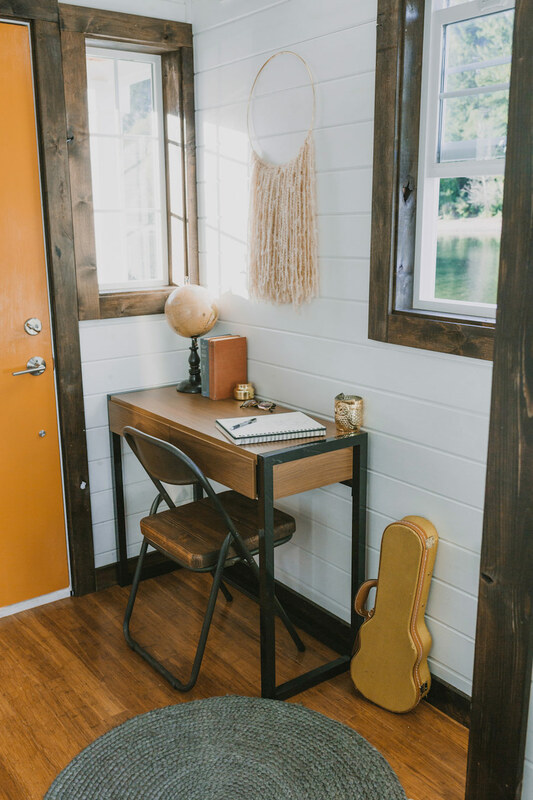 Hi my name is Matt Randolph I am looking for pictures of tiny homes to post on my website was looking to see if I could use some of the ones youll have please give me a call or email 402-340-4095. I would be giving you’ll full rites to the photos thanks for your time. Is that a combo washer/dryer? It’s true . 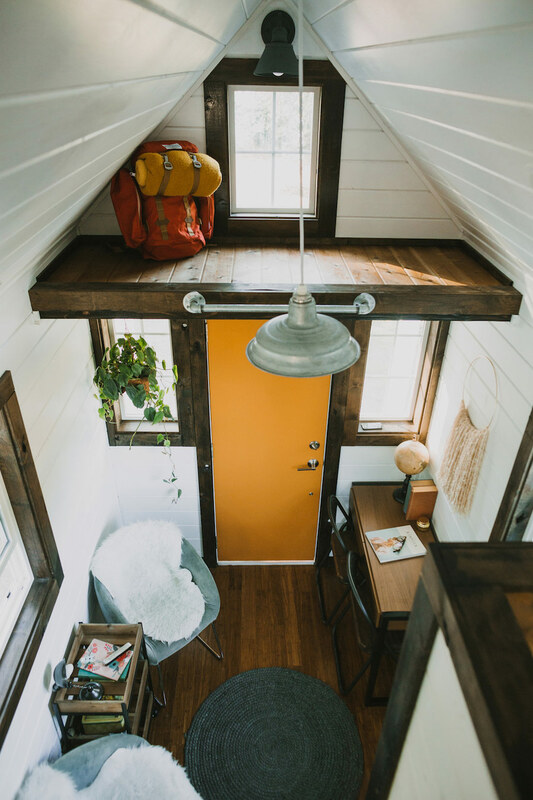 . . this tiny house is lovely. The white and dark wood contrast is gorgeous, especially in the kitchen. The light in the loft is spectacular. However, when I look at the photographs for too long it starts to drive me crazy. There’s way too many non-functional items around (the items on the small desk, the three lonely books in the bathroom). The kitchen only has two spatulas out for cooking utensils (I guess they fit a lot in that one utensil drawer) and the couple only wears four sweaters. My favorite part is how the pumps on the sink soap dispensers haven’t even been popped yet. 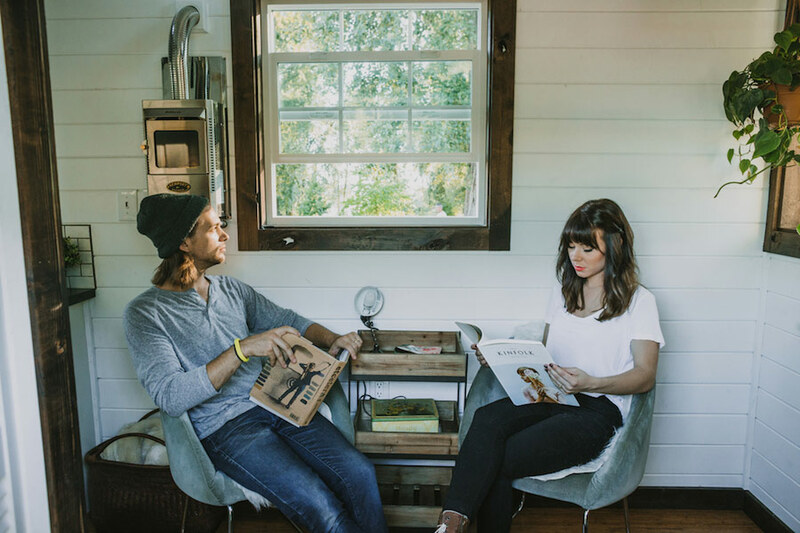 One of the big allures of the tiny house movement is the idea of downsizing clutter and unnecessary items . . . yet still retaining meaningful, important, and useful items. So, it doesn’t help me to decide if a house will work when the photographs are SO staged. I’d rather see this beautiful house actually lived in (to get an idea of how real items fit in the space and what storage there is) or completely empty so it’s easier to imagine how real items might fill the space. Thomas, I’m wondering many of the same things. I know it’s all about downsizing and finding multi use items. Maybe I could get along with one or two spatulas. But I do wonder what else is missing and what do I do with all my beloved books and clothes for each season and if tiny living is going to be practical for me at some point. Seeing beautifully staged homes is wonderful but I’d love to see one that is actually lived in day to day. 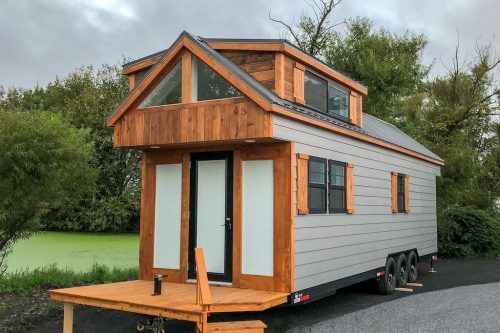 One of the more useful posts I did see one time was about a man that put his tiny home on a smaller lot but also had a storage shed/trailer for those things he knew there was no way he could live without but would clutter up the interior of his tiny home. He said it was about being practical and finding a solution to his storage needs that worked for him without paying for off site storage. But also about downsizing and not being driven by the consumer culture. Possibly on of the coolest things I have ever seen. What is amazing is how much like a house it is from a quality standpoint. Great work. The evolution of living and honestly a great option for those who don’t want a McMansion. Could see myself in one of these at some point or at least have it on a river or lake that’s unincorporated. WOW! I would love to see a floorplan for this impressive beauty! Beware of the Tiny Heirloom built houses. Their quality is very low. The fit and finish is terrible. They don’t use the right materials to withstand moving down the road or withstanding the elements. None of them are safe to tow because of their weight distribution. Almost all of them have come back with major problems.